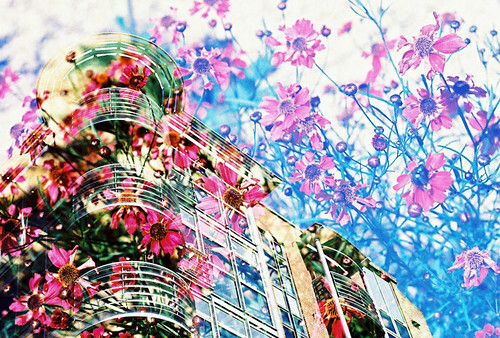 One of my favourite things about using film for photography is the joy of double exposures. I took these photos with my Nikon F55 which is a film SLR that you can pick up for next to nothing. It uses all the lenses that my D300 does so I get all the joy of film with all the modern technology that comes with digital. I used slide film and got it cross-processed at Photographique. For these photos I shot the whole roll of film around the city of Bristol where I live. I then rewound the film and put it through my camera again, photographing flowers and leaves and other naturey stuff. It’s pretty simple to do, there’s a tool for hooking the end of the film out of the canister once it’s wound back in or you can take it to your local photographic developing shop and they should be kind enough to do it for you. There are lots more here if you click on the thumbnails. That is so cool, a very cool way to keep using film and it creates artwork. Very Lovely!!! Wow, these are amazing! So beautiful!